College football is just around the corner -- we’re six weeks away from the Gophers’ season opener on Aug. 30. So, with that in mind, I’ll take a look at Minnesota’s 12 opponents by asking five questions to a beat writer covering that team. Today’s installment starts with the opener against New Mexico State. 1. New Mexico State ended a 57-year bowl drought last year and beat Utah State in the Arizona Bowl. What can the Aggies do for an encore? They obviously have some key question marks such as how to replace an NFL wide receiver (Jaleel Scott, fourth-round pick by Baltimore) and three-year starter at quarterback (Tyler Rogers). 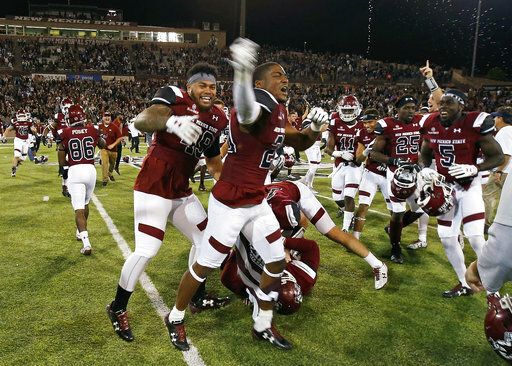 But New Mexico State has enough pieces returning, including nine starters on defense, to win enough games for bowl eligibility for a second year in a row. Their defense under coordinator Frank Spaziani was good at getting after the quarterback and limiting big plays. They have improved depth this season in the front seven, which always has been an issue. The Aggies’ schedule includes winnable games against New Mexico, UTEP and Liberty twice, as well as an FCS game (Alcorn State), which NMSU hasn't had for the past four years. As an independent, they most likely will need to win seven or eight games to justify a bowl game, such as the New Mexico Bowl or Arizona Bowl, because teams with conference bowl tie-ins would have an edge. 2. The Aggies played their final season in the Sun Belt Conference last year and are an independent team this year. What is the program’s future going forward? NMSU has the 2019 schedule nearly finished and several games for 2020 and 2021 as well, so I think there is an idea that it will last at least that long. After that, who really knows? There is a new chancellor at the university, and I'm sure they will look at costs to see if it makes any sense to remain independent after that. 3. If you had to pick one Aggies player on offense and one on defense who could be difference-makers this year, who are they and why? On offense, I will go with Matt Romero. He's a junior college transfer quarterback who looked good in spring practice. He's a strong runner, which coach Doug Martin likes, but he throws the ball on the run and looks to get the ball downfield, all qualities Martin looks for in a quarterback. NMSU has all but one returning starter back on the offensive line and plenty of skilled players returning, but the Aggies need production from the quarterback, assuming Romero wins the job in the fall. On defense it's Terrill Hanks, senior outside linebacker. Hanks is the best player on the team this year and is a four-year starter. He does a little bit of everything at the Sam linebacker spot. He made a huge play on the goal line in the bowl game, reading a pitch, knocking it down and recovering the fumble himself. The offense scores over 30 points. It's always a benchmark for Martin's offense, and toward the end of last season, the Aggies offense started to sputter a little bit. NMSU needs to be more balanced, and junior Jason Huntley is a good dual-threat running back. The Aggies won’t win if they put the ball in the air 35 times, which they did nearly every week last year. The defense isn't as good as advertised. NMSU never be will known as a defensive team, but the Aggies need that side of the ball to perform well early in the season while the offense gets into a groove. I expect the Aggies to give up some points to a Power Five team, but if they don't give up the gashing yards on the ground and turn guys loose in the secondary, I think they could keep the game close going into the fourth quarter, which they did last season at Arizona State.